May 24th Hike on Motion Path (With Company! ), a Foggy Jaunt on Tinkers Point, and an Interesting Link! Hello folks! It’s the 24th of May and we likes to get away, especially when we have new toys to play with! I was planning an overnight getaway for the May 24th weekend, the weather looked spectacular, and so I thought it’d be fun to hike with a couple of buddies of mine with whom I’d chatted about hiking. Our schedules all aligned for a Friday evening/Saturday morning hike, and so we settled on the Motion Path, given that the Miner Point campsite is close enough to one end that we could leave late in the afternoon and still make camp with plenty of time to set up and get a bite. Our second day would be a bit longer, but we had all day, so there was no rush. A good plan! The walk in over Shoal Bay Rd. is as advertised; rocky, wet, and not very scenic. That said, it was a quick hike, and we were on the trail in no time. Making our way past Nippers Cove, we saw a pair of otters playing by the shoreline! Well, playing is the best description I can give to their behavior, as I honestly have no idea what they were doing. The first was chasing gulls, and once he had rid the rocks of them, he dove into the water. The second rubbed his belly on the rocks for a couple of minutes, and then proceeded to stand on his front legs and jump with his hind legs a few inches off the ground. He repeated this five or six times, and then walked away, with his tail sticking straight out, following his buddy into the water. We didn’t know what to make of it. We felt lucky to have witnessed the creatures in their natural habitat, though! As we approached Miner Point campsite, a flock of gannets began diving into the water to the north of it. It was spectacular. With the sun starting to set, we arrived at the campsite and quickly got started setting up, Andy and I hanging our hammocks around the edges of the tent site, Evan’s tent between them. It was an ideal spot. It was a very cold night, though, and I didn’t get much sleep despite being quite comfortable in my new hammock. Andy and Evan did a bit better than me based on the snores I heard! The next day we got off to a slow start: we had the day in front of us, and only 11.3 km to walk, so we took our time packing up. The sun was hot by the time we got on the trail. Heading south from Miner Point, the trail is challenging in spots, with some significant altitude gain, starting with the climb up the Tolt. The trail and the weather was beautiful, but by the time we got to Motion Head, I was fairly exhausted, having gotten little sleep, and my companions were starting to feel the heat and exertion as well. We all spent the last of our reserves climbing up to the top of Big Hill, and were quite happy to see our vehicle in Petty Harbour. An exhausting but exhilarating hike! As someone who typically hikes alone, it was a really great experience having my buddies overnight with me on the trail. I had a great time and I think they did as well despite their first overnight on the ECT being a bit of a challenging one! Check out the pics of our adventure below! Earlier that same week I had a chilly, foggy jaunt on Tinkers Point Path. I was surprised by the fog… well, as much as a hiker from NL can be surprised by fog, but it kept me cool as I tried to make good time between Mobile and Tors Cove. The trail is in great condition and as always is one of the most spectacular when it comes to scenery, even in the fog. Check out some pics below! Amelie Hikes the East Coast Trail – a 2.5 year old who has taken up hiking! Just too cute for words, and what a great way to introduce your child to nature! Check them out! 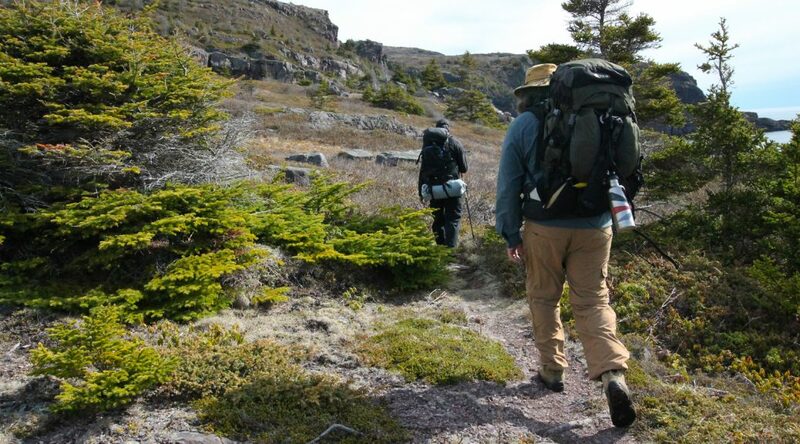 Previous PostThe First Half of May on the ECT – Lots of Hikes and New Gear!Next PostAn Afternoon on Brigus Head Path!